Whenever he has something really special, he brings it to school to show his teacher, Gwen. The flag promptly went in his backpack for the next day. He got on the school bus with the flag pole sticking way out of his backpack over one shoulder. All day I wondered what he would say to his teacher about the rally. He knows a few of the facts of mass arrests, beatings and killings and he saw some graphic pictures. Would he be able to get his teacher’s attention and find the words to sum up what is going on in Ethiopia and what he participated in at the state capitol? When he got off the bus, the flag was not in his backpack. It was in his hand and he waved it as he crossed the street in front of the bus to meet me. Curious, but knowing I had to wait for the stories to bubble out on their own, I casually asked how his day was and if he showed Gwen the flag. “Mmmhmm. AND I showed all the students too,” he said. 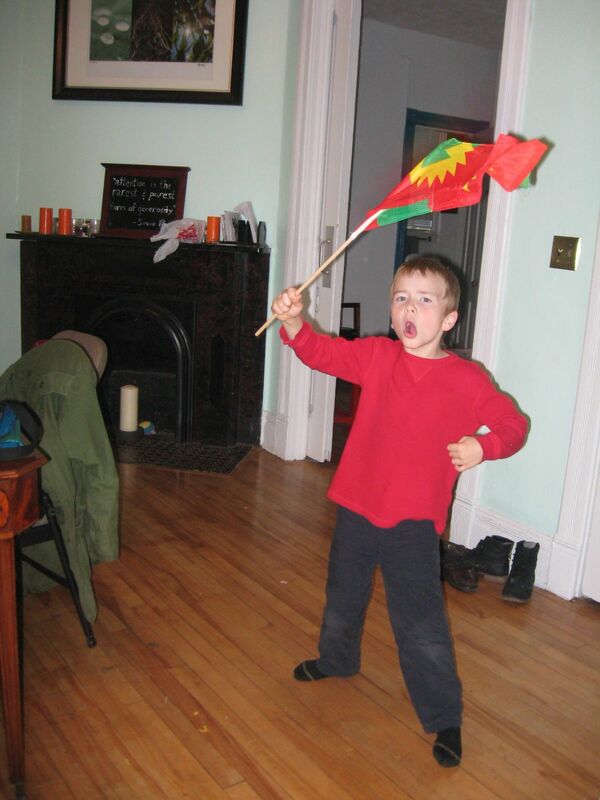 Later while he was eating his snack he thought to mention that he and his only Oromo classmate, a girl, talked about the flag. These two kids are in kindergarten. Jonas seems like class clown material sometimes, still too early to say. He sure loves to try to make people laugh. 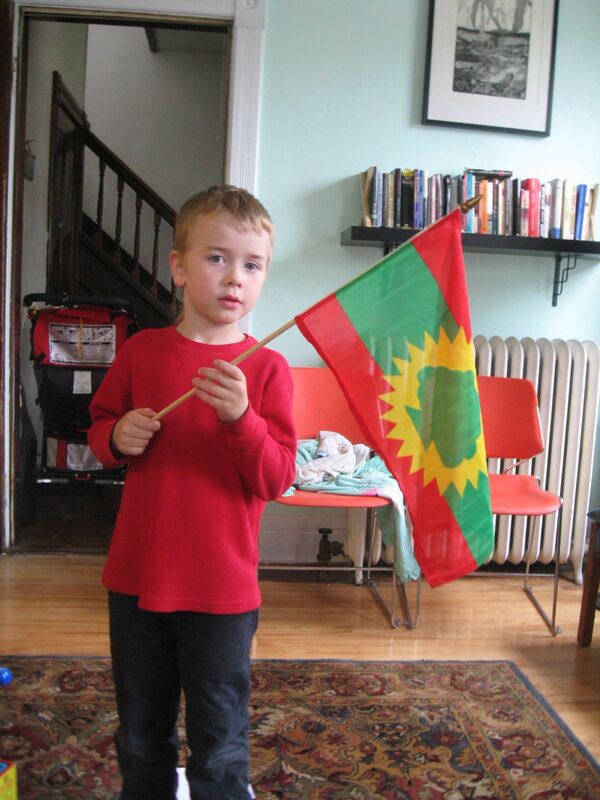 Yet that same silly boy took an Oromo flag to school, talked to his teacher and class about it and made a connection with a classmate who might otherwise not have had a chance to share that bit of her family’s story in school until some future grade. I hesitate to tell the story because maybe it seems like I think what Jonas did was heroic or outstanding. I don’t. I think it’s just profoundly human. Secretary of State John Kerry meeting nurses and workers during a visit to the Gandhi Memorial Hospital in Addis Ababa, Ethiopia on May 1. Members of Minnesota’s Oromo community plan to rally Friday in St. Paul and are calling for a hunger strike to mourn the deaths of student demonstrators gunned down last week by Ethiopian security forces in Addis Ababa. Oromo students and others in Ethiopia have been protesting since April 26 a plan to develop the capital Addis Ababa, saying the proposal will displace farmers in the city outskirts, erase significant landmarks and dismantle the rich culture and identity of the ethnic Oromo people. Because the Oromia region surrounds Addis Ababa, an expansion of the city will mean a further blow to the region and its people, who have been marginalized for decades, they say. Addis Ababa city officials argue the plan will develop and improve the city — one of the fastest growing cities in Africa — and its surrounding suburbs. Thousands of people, mostly university students, took their anger and frustration to the streets of Addis Ababa to express their disapproval of the plan unveiled in April. The ongoing demonstration erupted in violence May 1, the day U.S. Secretary of State John Kerry visited Ethiopia as part of a tour of Africa. There are conflicting reports about casualties, with government officials saying the death toll has grown to 11 and witnesses counting nearly 50 dead. Hassen Hussein, an assistant professor at St. Mary’s University of Minnesota and a longtime Oromo community activist, said in an interview Thursday that the regime has killed more than 75 demonstrators and wounded up to 200. Whatever the case, Nasser Mussa, a Minneapolis Oromo-American activist, noted that the demonstrators have been peaceful and were attempting to exercise freedom of expression and demanding their rights. “Killing unarmed protesters is unacceptable and should not be tolerated,” Mussa said. “The Ethiopian government says they are democratic, but they have been doing undemocratic things for years, including the killing of innocent people and committing other serious human rights abuses. Members of the Oromo community in Minnesota will assemble Friday outside the state Capitol to call attention to the killings and condemn the Ethiopian regime. At the rally, which will run Friday to Sunday, demonstrators plan a hunger strike and a 24-hour vigil. “Although experience of oppression at the hands of the Ethiopian government is not new to the Oromo population in the Twin Cities, nothing in my recent memory has moved the community as much as the killings of peaceful protesters these past two weeks throughout the vast Oromia region,” said Hussein. An estimated 40,000 Oromos live in Minnesota, the largest concentration outside Ethiopia. Hussein, who is organizing the protest, and other demonstrators hope the event will raise awareness. The United States provided the Ethiopian government more than $135 million for humanitarian aid this year. Hussein and Mussa said that aid isn’t used to assist vulnerable populations. Instead, they said, it’s used for human-rights abuses. The East African country has more than 80 ethnic groups, according to the report. It has a federal-government system, with its boundaries generally divided into ethnic groups. Likewise, its political parties largely remain ethnically segregated. Other human rights problems included arbitrary killings; allegations of torture, beating, abuse, and mistreatment of detainees by security forces; reports of harsh and, at times, life-threatening prison conditions; arbitrary arrest and detention; detention without charge and lengthy pretrial detention; a weak, overburdened judiciary subject to political influence; infringement on citizens’ privacy rights, including illegal searches; restrictions on academic freedom; restrictions on freedom of assembly, association, and movement; alleged interference in religious affairs; limits on citizens’ ability to change their government; violence and societal discrimination against women and abuse of children; trafficking in persons; societal discrimination against persons with disabilities. The Oromo ethnic group makes up about 40 percent of Ethiopia’s 94 million people, the largest ethnic group in the country. (A4O, 14 May 2014) The Ethiopian Government Jams the Satellite Transmission of the Oromia Media Network (OMN). According to the press release the organisation has learned that its regular transmission on ArabSat has been interrupted as of 04:38:00 GMT this morning. “This is following the blocking of our website www.OromiaMedia.org since May 2, 2014 in Ethiopia,” says the Press Release. It is worth noting that the Ethiopian government is notorious in blocking and jamming alternative media outlets, and violently silencing critical journalists. The OMN Satellite TV broadcast, the first of it’s kind serving the Oromo people and their neighborhood, has been airing original contents produced under strict guidance of journalistic ethics. “We would like to reassure our audience that OMN will be back on air very soon. Our staff and management are working hard to find a solution for this blockage, ” added. In the meantime it asked its audience to be patient and follow its transmissions on social media via YouTube and Facebook as it will continue to produce reports and original programs uninterrupted. Finally , “we call up on our audience to renew their resolve to sustain the OMN initiative,” says the Press Release.